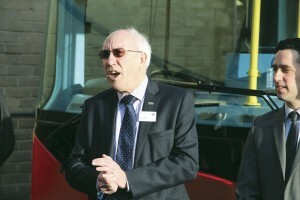 Leon Daniels, TfL’s MD Surface Transport, didn’t hold back at the launch of two new BYD e-bus electric buses at Go-Ahead’s Waterloo depot on 18 December. 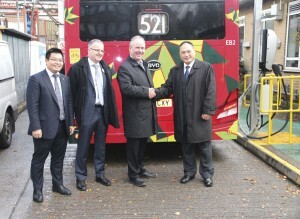 ‘This is a really exciting day for us,’ he said, ‘We hope to see hundreds of these in due course.’ He had been to the BYD Auto plant in Shenzen where it had been explained to him that if you wanted an electric bus to run to Aberdeen and back at 70mph every day that wasn’t a role it was suited for, but it was ideal for use as a single deck urban bus. Two have been acquired on a lease basis by Go-Ahead’s London General operation, which will run them alongside Mercedes-Benz Citaros until June 2016. They will be operating initially on the 507 route between Waterloo Station and Victoria Station via Lambeth Bridge and Horseferry Road, which is a light duty with longer spread overs. If all goes to plan, they will graduate to the more demanding 521 between London Bridge Station and Waterloo via Monument, Cannon St, St Paul’s, Chancery Lane, Holborn and Aldwych. These routes have been chosen because TfL believe the technology is particularly suitable for busy short commuter services between Victoria, Waterloo and London Bridge stations. 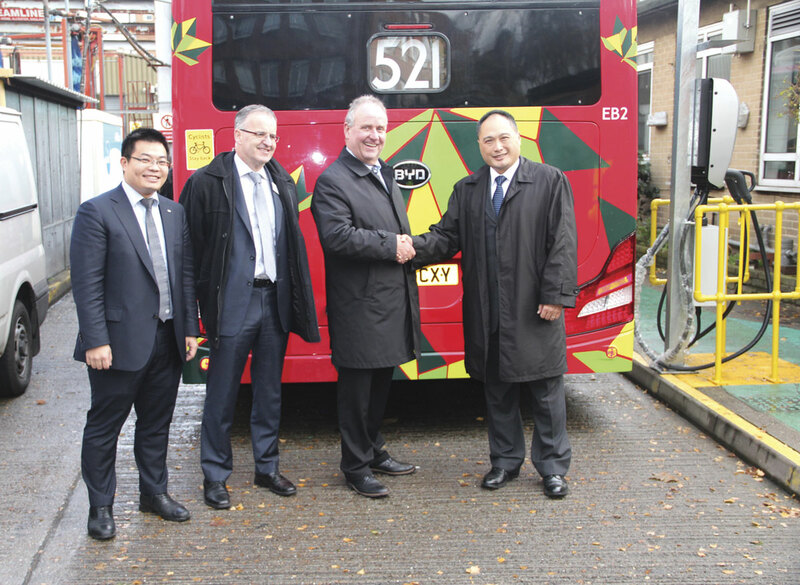 Isbrand Ho, BYD’s General Manager, BYD Auto Europe, indicated that although the initial cost right now, at between £300-£350,000 per bus, was high, operators were looking at the cost of ownership over ten years. The e-bus had the potential to save 75% on fuel costs compared with a diesel bus. He based this figure on the fact that recharging an e-bus from empty currently cost £19.44 using off peak electricity as buses were generally recharged at night. An energy consumption figure of approximately 130kWh/100km in urban conditions is claimed. The 12m long, two door buses have a 5.95m wheelbase, carbon steel chassis and aluminium bodies. They have been specified to meet TfL’s requirements with features such as Ventura doors. They are propelled by two BYD permanent magnet synchronous AC motors integrated within the rear wheel hubs. Each has a maximum power output of 90kW/h and produces maximum torque of 350Nm. The top speed is 70km/h (43.5mph). Power comes from the 600Ah, 324kWh BYD Fe batteries. Compared with a diesel electric hybrid bus, the full electric e-bus needs three times as much battery capacity. This takes up a considerable amount of space though not as much as on earlier BYD generations. On the bus they are located in three banks, one each over the two front wheelarches and a third at the rear on the roof. In theory the batteries give the buses a range of between 200-250km a day, which would be sufficient to complete a full day on the 521. They are designed to use no power at all when stationary. The question for the operator is what London’s heavy traffic will do to all aspects of their performance. In conversation Mike told me that there was increasing interest in electric buses generally and TfL was trying to build up experience and understand what the range of the vehicles was like. 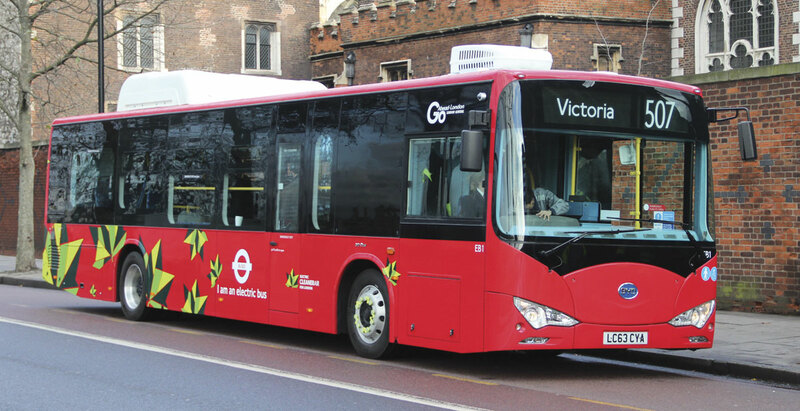 A major concern with electric buses has been uncertainty over battery life. BYD was a battery producer before it began building buses a decade ago and believes that the Fe (Lithium Iron Phosphate) batteries supplied with a bus should last the operating life of that bus. It claims that those on the e-bus are good for over 4,000 cycles from fully charged to discharged and back to fully charged which at one charge a day equates to just under eleven years. After this they can be used for a second life in the telecommunications industry. BYD has opted for Lithium Iron Phosphate technology because, although it does not offer the highest energy density, it is the safest and coolest in operation. Some others had chosen to go the Lithium Iron Cobalt route which gave instant power but could get very hot. It was also very flexible operating at between minus 35 degrees and plus 100 degrees although the minus 20 to plus 50 degree range was its ideal range. In cold weather, the battery management systems allowed more electron flow to keep the batteries warm. 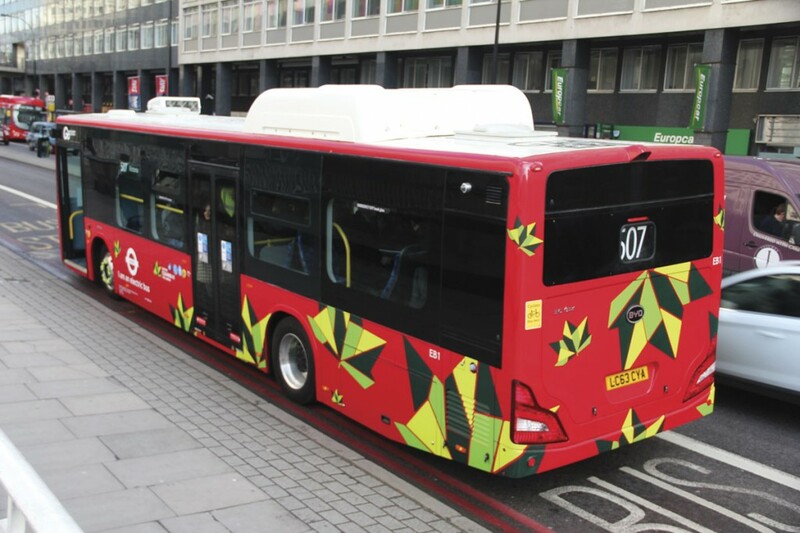 Buses supplied in Sweden had a water jacket system to keep battery temperatures up in winter, but this was not considered necessary in London. Isbrand Ho accepted that BYD had ‘traded capacity for safety’. The battery cells are flat, each one like a 5mm thick sheet of A4 paper, that are installed in modules that are then put together into a pack. Isbrand Ho said later that BYD was constantly developing in order to increase the energy density of its batteries by between 3-5% every year. ‘By the end of the test we will have 10% more range from the same batteries which means less batteries or a lighter bus,’ he said. He also revealed that BYD was seeking to reduce the time it took to charge each bus to half or less.